On August 3rd the Baltimore Orioles had a record of 32 and 73 and appeared to be heading not only for a 100 loss season but very possibly 110 or more losses. Under Manager Dave Trembley and Interim Manager Juan Samuel they had lost 52 games before they had won 20. It was a dismal record for a team that was demoralized and without real leadership. Trembley and Samuel were both gentlemen and loyal organization people. They were both popular with players but could not inspire them to win. The organization was not only a losing organization of the field but in all departments except the minor league system. Unfortunately the promising prospects coming out of the minors entered a clubhouse where losing was accepted as a way of life presided over by an owner who did nothing to promote winning and spent no money to get All-Star caliber veterans to help provide leadership to the team. Instead of hiring top quality managers they settled for second and third tier managers for years, men who were good guys but terribly lackluster leaders and not Major League caliber managers. The Orioles at that point seemed to be a franchise on the brink of an unrecoverable death spiral. In my times at Harbor Park last season and this season Elliott the Usher and I would spend much time together and muse about how if we ran the Orioles that things would be different. As we talked about how to solve the problems of the world, in particular those of the Orioles I finally said that it was not the talent. I felt last season and this season that with the talent available at the Major League level as well as what the Orioles had in their farm system that they should at least be a .500 team this year. But for the first two thirds of the season that was not the case and I told Elliott at the end of April that it was not the players but on field leadership that was the problem. I thought the Dave Trembley was a nice guy and a good minor league manager but that I felt that he had not been able to step up his game to the Major League level. In fact I commented back on September 29th 2009 that I thought that Trembley needed to go. I remember when Showalter was hired and I took a look at his track record. He has been successful at every team that he has managed. In fact he was in large part responsible for building the Yankees team that Joe Torre would lead to 4 World Series Championships. He did the same foundation laying work in Arizona with the Diamondbacks. I would dare say that without Showalter building the foundation that Joe Torre might have been about as successful in New York as he was with Mets, Braves, Cardinals or Dodgers. All of Torre’s championships came with the Yankees. I believe that this was in large part due to the acumen of Showalter and the willingness of George Steinbrenner for big name player as well as building up an excellent Minor League system to spend the money needed to produce a winner. 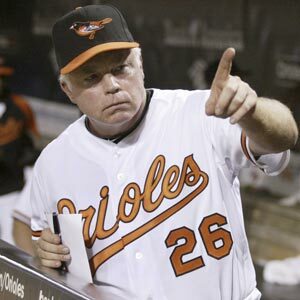 When I saw Showalter begin to manage the O’s I knew that he would change things and that the team would start producing. Since he took over the Orioles have won 25 and lost 15 and for the first time since 2008 had two consecutive winning road trips. They have the second best record in the American League during this time period behind the Minnesota Twins. The Orioles are now beating the teams of the AL East and in the past week have taken 2 of three each from the Rays, Yankees and as of tonight the Blue Jays who they will play again tomorrow. Showalter and his hard driving style, ability to get the most out of players and develop young talent is already remaking the Orioles. Any observe can sense that this team, which before Showalter’s arrival was described by Forrester as “a lot of people — players, coaches and management — who have done nothing but LOSE in their respective careers in Baltimore… Pick a player on the team. I don’t care what his name is or what his stats show, I can guarantee you this: He’s contributed to LOSING during his time here. Guys who won elsewhere in their career – like Tejada and Millwood – show up here…and start losing. It’s the “Oriole Way”. That has changed. As of tonight they have won 4 consecutive series for the first time since 2004. The Orioles have made one of the most dramatic end of season turnarounds in recent memory. Players universally talk about Showalter’s tough expectations and the difference in the clubhouse. They now believe that they can win any game against any team that they play. The starting pitching is one department where things have changed When Showalter arrived; the rotation of Kevin Millwood, Jeremy Guthrie, Matusz, Brad Bergesen and Jake Arrieta had a combined record of 15-45 with a 5.50 earned run average. As of September 7th under Showalter, those pitchers are 15-11 with a 3.23 E.R.A. The Orioles management has stated that the off season will be very busy. There will be a lot of moves and hard evaluation of talent. There is a new sheriff in town, and his name is Buck. I expect that the Orioles will now be a factor in the AL East. I do not expect them to be the “Washington Generals” of the division and they will make the East a very interesting division next year as teams that were used to getting 10-15 wins at their expense will have to fight the Orioles at every step of the way. It will be fun to watch the Orioles the rest of this season and next year as they take flight as they have not in the last 14 years. This could well be the start of something good.